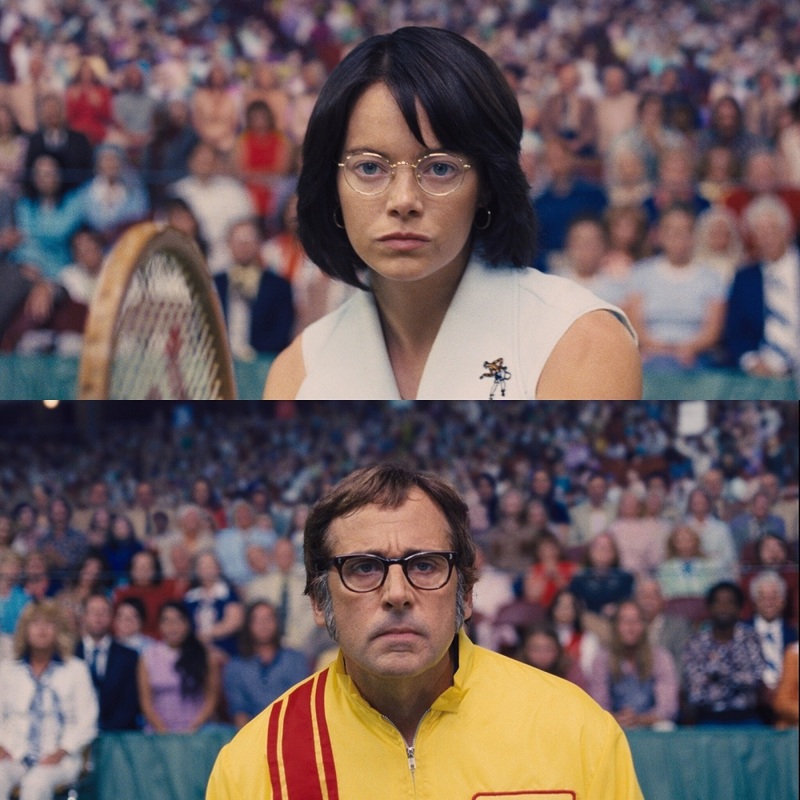 Directed by Jonathan Dayton & Valerie Faris (Ruby Sparks, Little Miss Sunshine) and Simon Beaufoy (Everest, Slumdog Millionaire), Battle of the Sexes is based on the titular tennis exhibition match between male and female players in 1973, while dramatising the lives and motivations of Billie Jean King (Emma Stone), one of the very top female players at that time, and Bobby Riggs (Steve Carell), a retired player who was former world no. 1, around that period. It was a time where women’s top prize in tennis were only 1/8 of men’s prize and due to this unfair arrangement, King founded a women-only tennis tournament and tour which eventually becomes what we know today as the WTA (Women’s Tennis Association). And the 55-year-old Riggs, being an addicted gambler, seizes the opportunity to challenge top active female players under the pretense of proving that men are superior to women. These historic events are truly inspiring and even though I’m never a fan of the sport, I’m still surprised that I never knew about it. The film does extremely well in depicting these events and people, and dramatising them just enough to make it fun and engaging. It is enjoyable even with my lack of knowledge with the game and I totally cared about King’s fight against sexism. Apart from gender equality, King also struggles with her sexuality. Despite being married to the highly supportive Larry King (Austin Stowell), she finds herself helplessly falling in love with her female hairdresser Marilyn Barnett (Andrea Riseborough) but it was the time where gays were heavily discriminated which causes King’s denial and automatic decision to stay a closet-lesbian. The film and the great performance by Oscar-winner Emma Stone (La La Land, Easy A) portrays King’s dilemma and distractions very effectively, and while I believe that people have the right to be with anyone they want regardless of gender, I felt awful for her husband in the film. Golden Globe-winner Steve Carell (The Big Short, Foxcatcher, The Office TV series), too, gives a compelling performance as the layered Robert Larimore “Bobby” Riggs who’s this loud old jerk on the outside but on the inside, he has a personal struggle of his own where the film explores his addiction with gambling, marriage and how he might love to win but not necessarily care about proving men’s superiority to women. 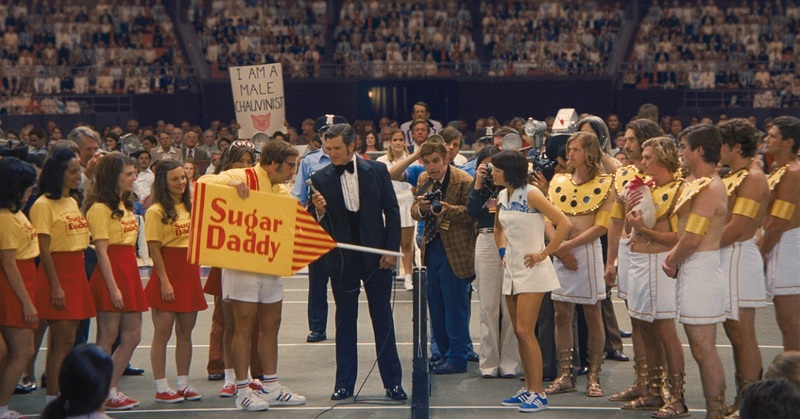 There are only two things I feel are missing in the film — the love for tennis itself and a stronger message to why gender equality in sports doesn’t mean that women has to be as good as men in it. 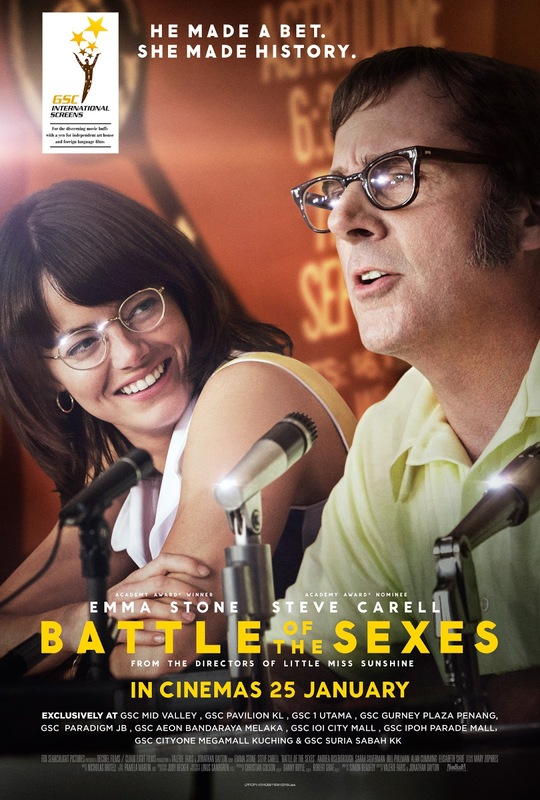 However, this is still an important story and Battle of the Sexes manages to tell it in an entertaining, crowd-pleasing way while also being genuinely inspiring and emotionally engaging. Malaysian censorship: Intimate lesbian scenes are cut (damn it). Verdict: An entertaining crowd-pleaser but also inspiring and emotionally engaging.